The NHS has covered up thousands of ‘suspect’ deaths in hospitals across England, sparking calls for an urgent inquiry, The Mail on Sunday can reveal. According to the expert who helped to expose the Mid-Staffordshire hospitals scandal – where hundreds died due to poor care – health chiefs have systematically excluded up to 19,000 ‘unexpected’ deaths from official statistics over the past five years. Professor Sir Brian Jarman says his shocking findings mean there are dozens of ‘potentially unsafe’ hospitals that should be investigated over high death rates, but which are being overlooked. Last night, Liberal Democrat Health spokesman Norman Lamb demanded that Health Secretary Jeremy Hunt look into the claims as a matter of urgency. Mr Lamb, who was a Health Minister in David Cameron’s Coalition Government, said: ‘These revelation are deeply disturbing. I am writing to Jeremy Hunt and to NHS England chief executive Simon Stevens asking for Prof Jarman’s analysis to be assessed as a matter of urgency and for a full response to be provided. 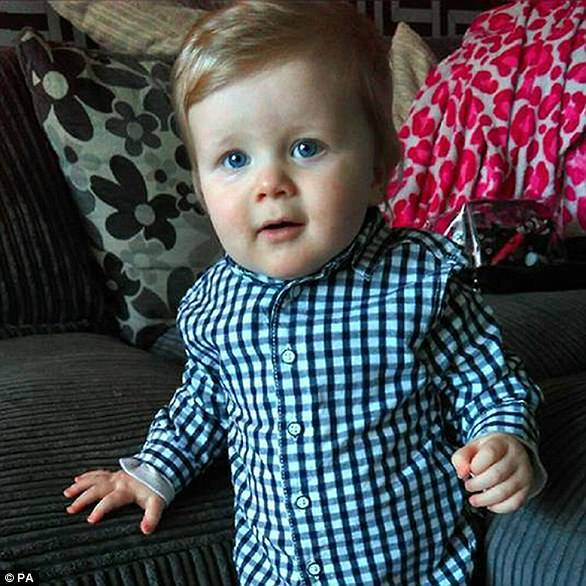 Little Kayden Urmston-Bancroft died of a heart attack last year after doctors at a hospital where death rates are now under scrutiny failed to operate on him for three days. His family’s lawyer described Kayden’s death as ‘entirely preventable’. The 20-month-old had a life-threatening hernia and was due to have an operation to rectify the problem after being admitted to Royal Manchester Children’s Hospital, above, in April 2016. His grandmother, Julie Rowlands, claimed Kayden was ‘put in a room and left’. He subsequently went into cardiac arrest and died two days later. ‘All we got, nearly every day, was, “He’s not having the operation today,” ’ she said. Surgeons claimed managers had prioritised hitting waiting-time targets for pre-planned operations over emergency care. The Trust has been ranked as having normal death rates for the past five calendar years. But under Prof Jarman’s analysis, it should have been classed as having high death rates in 2012 and 2016. When mother-of-three Deborah O’Hara died in June 2015, three days after a cancer operation at University Hospital Coventry – one those highlighted by Professor Jarman – her husband Andy believed his wife had been the victim of tragic bad luck. But the 45-year-old’s untimely death had been caused by a surgical error, which hospital bosses neglected to reveal to Mr O’Hara or the coroner. He found out three months later when told by journalists. Mrs O’Hara’s death came when the NHS Trust which runs the hospital was classed as having an ‘expected’ mortality rate. However, under Prof Jarman’s analysis, it should have been ranked as having a higher than expected death rate. During the six-hour operation, consultant urologist Dr Andrew Blacker mistakenly clamped a large artery, causing a lack of blood supply to Mrs O’Hara’s bowel. 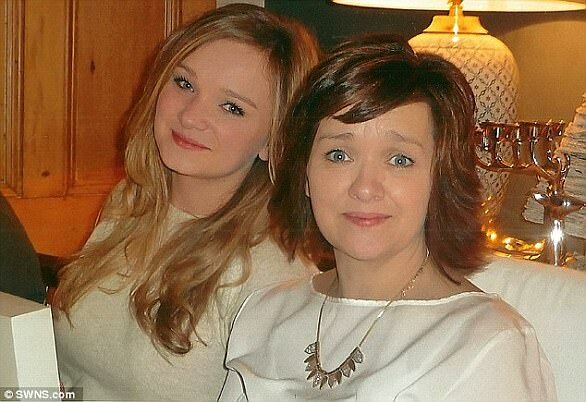 At her inquest last December, Mr O’Hara said he and his family had lost ‘a lovely wife’ and a ‘brilliant mum’. The Trust apologised to the family. Prof Jarman reached his alarming conclusions after studying official hospital death rate figures using an internationally accepted method – a method used as standard in health systems across Europe and the United States. 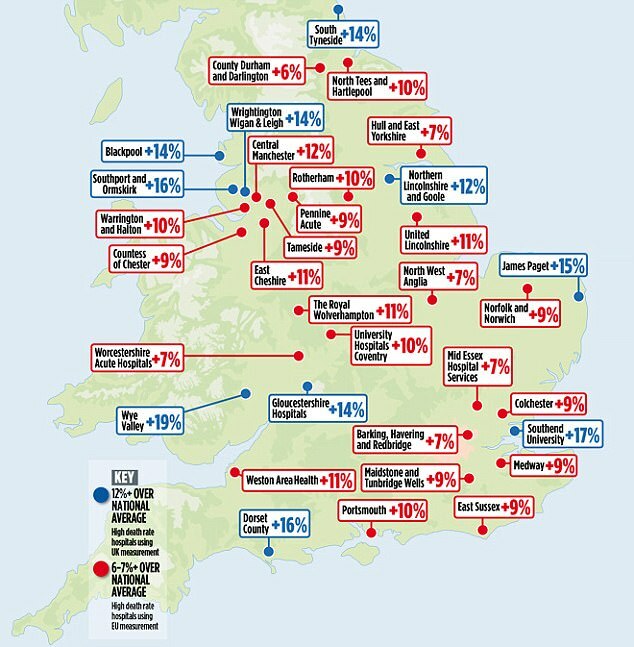 He calculated that there were 32,810 ‘unexpected’ deaths in English hospitals over the past five years. But using the NHS’s preferred method, only 13,627 were classed as such – a difference of 19,183 deaths. In addition, the method Prof Jarman used, which is recommended by the UK’s Association of Public Health Observatories, classified 34 hospital trusts across England – responsible for 87 acute and community hospitals – as having significantly high death rates last year. By contrast, the NHS method counted just ten trusts, covering 18 hospitals, as having death rates above ‘expected’ levels. When Prof Jarman raised concerns about the Mid Staffordshire NHS Trust in 2007, he was ignored by the Department of Health – but it became one of the most shocking NHS scandals in history. Now he says NHS officials are ‘fudging the figures’, resulting in potentially fatal problems on hospital wards being ignored. He added: ‘If you use internationally accepted criteria, then 34 hospital trusts have high death rates. ‘But because the NHS is using what might be called a “fudge factor”, they are only identifying ten. Prof Jarman said the NHS had used the internationally recognised system, called Byar’s confidence intervals, in the past. Until January 2012 it was used in tandem with another method – called overdispersion – which aims to give hospital trusts more leeway before being classed as having high death rates. But the Byar’s method was then dropped, with bosses at NHS Digital, the Health Service’s statistics body, saying it was confusing to have two systems running at once. They chose the overdispersion method – which results in far fewer hospital trusts being classed as having significantly high death rates. Under that system, a trust is regarded as having a high death rate only if its measure, called the Summary Hospital-level Mortality Indicator, or SHMI, is about 12 per cent or more above the national average. In contrast, the Byar’s method, which Prof Jarman applied, is much stricter, classing anything with a SHMI of more than six or seven per cent above the national average as significantly high. Ten years ago Professor Sir Brian Jarman, sent a series of ‘mortality alerts’ to health bosses about what was then a little-known part of the NHS in the middle of England. Its name? Mid Staffordshire NHS Trust. He and his colleagues at the Dr Foster Intelligence Unit were concerned that death rates at Mid-Staffs, as it became known, were considerably higher than average. How much higher? About 27 per cent. But he and his team were on to something big. Soon afterwards, personal reports of the shocking ‘care’ that patients at Stafford Hospital had received started emerging. Added to the death rate data, the reports led to an investigation by the Healthcare Commission, the watchdog at the time. Its report, and subsequent official inquiries, revealed a culture pervading all levels of the Health Service, where criticism of the NHS was ignored or suppressed – with lethal consequences. NHS bosses argued the approach they chose was the more suitable of the two, as it ‘better reflected’ the difficulties in comparing death rates among hospitals which serve very different areas. Some serve populations that are poorer and sicker than others, meaning that – if the quality of hospital care is the same – they are likely to have higher death dates. Hospital mortality rates are adjusted to take into account these underlying demographic differences, to create a level playing field. However, NHS Digital argues that these differences produce so much statistical noise, that many more hospital trusts need to be given the benefit of the doubt. Prof Jarman said: ‘I object to the system NHS Digital is using, because they are applying a method which really just reduces the number of high death rate hospital trusts.’ He claimed even advocates of the NHS approach admitted it was not based on ‘hard science’. And he said that if a trust was reclassified as having a ‘normal’ death rate, then hundreds of deaths previously classed as ‘unexpected’ would suddenly be recast as normal too. Worryingly, Prof Jarman’s painstaking research shows a clutch of hospital trusts with consistently high death rates are flying just below NHS Digital’s radar. Among them is United Lincolnshire NHS Trust, officially categorised as having a high death rate in 2015 only during the five-year period from 2012 to 2016. But under the Byar’s system it would have been marked as a high death rate trust in four of those five years. United Lincolnshire, which runs four hospitals in Lincoln, Grantham, Boston and Louth, was put in special measures for an unprecedented second time in April, after the Care Quality Commission (CQC) found ‘a deterioration across a number of services’. Warrington and Halton Hospitals NHS Foundation Trust, officially rated ‘normal’ in four of the five years, would instead have been classed as ‘high’ in all five years under the Byar’s method. The latest CQC reports for this trust, published in July 2015, gave it a ‘requires improvement’ notice – the second lowest ranking after ‘inadequate’. Last night Shadow Health Minister Justin Madders urged hospitals to be open with their patients about the quality of services. But Professor David Spiegelhalter, president of the Royal Statistical Society, defended NHS Digital’s approach. Prof Spiegelhalter, who was a member of the team that selected overdispersion, said it rightly gave ‘some additional leeway to hospitals, to allow for the inevitable problems of fairly comparing mortality rates’. Ignoring these comparison problems, as Prof Jarman’s system did, was therefore unjustified, he said. Professor Simon Constable, medical director of Warrington and Halton Hospitals, said its mortality rates had been falling over the past two years and were now within the ‘expected’ range. Imagine for a moment that a fifth of NHS hospitals in England were officially classed as having abnormally high death rates. It would be scandalous. People would wonder if their local hospital was up to scratch. And they might question how well the NHS was coping after years of financial restraint. You can see how the powers- that-be might not be too keen on publishing statistics like that. You can see how they might choose to use a method that minimised the number of hospital trusts classed as having high mortality rates. And that is exactly what Prof Jarman’s excellent analysis has exposed. He has discovered that, using an internationally accepted statistical method, 34 hospital trusts across England last year had mortality rates above the ‘expected’ range. By contrast, using its own method, NHS Digital classed ten trusts as having high death rates. This ‘official’ method meant a hospital trust could have a mortality rate that was 11 per cent above the national average, and still be classed as ‘normal’. Is this right? Or does it risk sweeping under the carpet very real problems at a significant number of our hospitals? Sadly, so many times over the past decade I have heard the hollow promise that ‘lessons will be learned’ from some entirely preventable tragedy; or the empty pledge of greater ‘openness and transparency’ after a cover-up. In fact, Jeremy Hunt has tried to make transparency the byword of his long spell as Health Secretary. He’s sold himself as the man who will not let another Mid-Staffs happen on his watch. But Mr Hunt and his mandarins risk burying their heads in the sand if they blindly accept statistics that appear to show that all is well in our hospitals. And if they can’t see the truth of what’s going on – or don’t want to – then that’s a dangerous thing.